I found a turbo from an Allis Chalmers. Can anyone help me figure out the specs? Does anybody have any experience with turbocharging a 3 cylinder D-179. 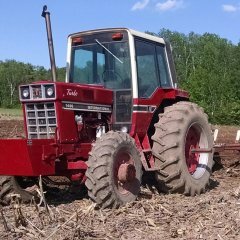 Not looking to get too crazy, just want to add another 10 or 15 hp or so to my Case IH 3220. From what I know, this is a pretty robust engine and should handle the turbo well.